In the past I have written about my childhood holidays at Pontins Holiday Camps, and made a passing reference to the Bluecoats. I found this photograph in my collection, of one of the group, I’m not sure what year it was taken. The Bluecoats were in charge of the entertainment and ensured we all had a good time. On the page above we have Janet Davies and Billy signing from Pontins ’66 and one below from Tommy Bass, Little Canada (the name of the camp) August ’66. I particularly like the way people had good handwriting and you’re able to read the names, some autographs I have from more recent years are not really legible and I’ve forgotten who some of them are! I don’t know why I liked collecting autographs, I guess I’m just a ‘collector’ type of person! I have some more that I will scan and share at a later date. This entry was posted in Beginning life in Hove and tagged Pontins. Bookmark the permalink. I miss the old autograph books. Who has time for something like that any more? Sigh. I had an autograph book when I was in jr. high. It was so much fun to get autographs from friends. I wonder what ever happened to it. A lot of my autographs from my first book are from friends, I really enjoyed getting the book filled! 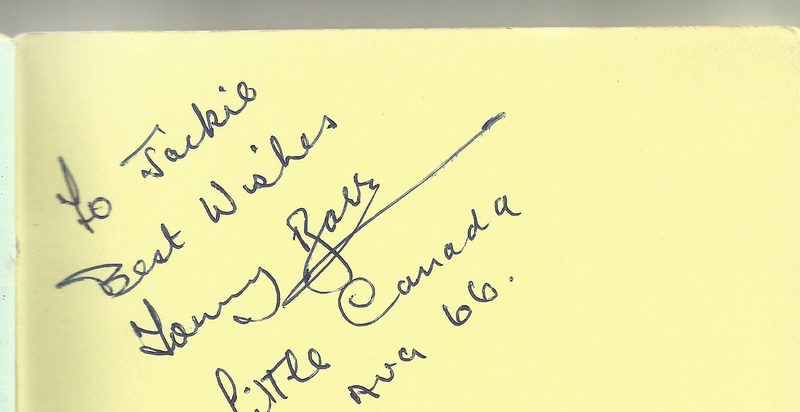 I think the Little Canada 1966 autograph is Tommy Barr not Bass. He worked there for a number of seasons with the Blue Coats. Hi Andy, really interested to hear this, and thanks for putting me right! Do you mind me asking if you know him, is he still around? I would love to learn more about those great holiday camps in the 1960s and see more photographs. If you prefer, use my email: jackiedinnis@rocketmail.com Hope to hear from you again. Hi Jackie Do you know when and where the picture at the top of the page was taken, I think I know the gentleman with the large moustache. In answer to the above re Tommy, I new him well sadly no longer with us he died in the late 1970s not sure of the exact date. Hi Andy, I’m not exactly sure where the photo was from, I would guess at Little Canada from 1966, our next holidays were at Bracklesham Bay (1967) or Camber Sands (1968). I hope this helps, that is certainly a great moustache – not easily forgotten. Sorry to hear about Tommy, I have many happy memories of that holiday. Wish I still had my old autograph book. The entry I remember best is one from my dad: ‘Money isn’t everything but it means a lot. I only wish that I had more than I have got!’ Not great grammar, but fairly typical of the kind of things people tried to come up with. That’s a great little poem from your dad, and you’re right, very typical of people’s efforts back then! Thank you for the menories. 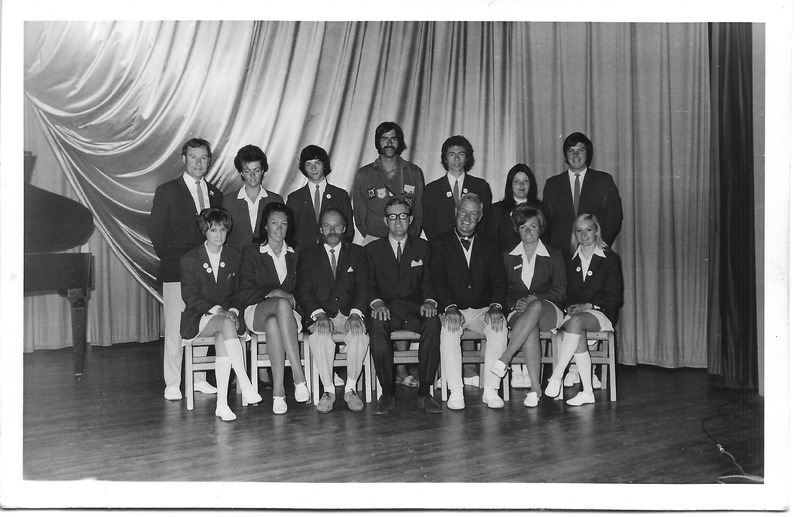 The photo was 1970 Camber Sands I was one of the Bluecoats, Tony third from left back row. Sorry cannot remember name of guy with large moustache at back. One sitting with moustache in front was Billy Crush. Back row third from right was John Rayner good frend of mine then lost contact after I mover to New Zealand.